The first film of its kind advocating the protection of predators and ecosystems, On Nature's Terms uses dramatic footage and inspirational stories to show how ordinary citizens in both rural and urban America are doing their part to coexist in harmony with predators. 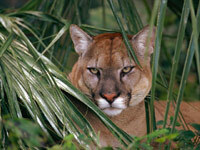 Produced by award-winning filmmaker John de Graaf (AFFLUENZA), this ground-breaking film makes the important connection between the ecological, economic, and social factors essential for carnivore species conservation and the necessity of protecting the large connected expanses of land necessary for their survival. On Nature's Terms chronicles how age old myths and misperceived notions about these animals devastated predator populations and brought many near to extinction, when settlers made their way west - and how many of these myths still persist today. The overwhelming message of this film is about hope and possibility; how ordinary citizens - biologists, conservationists, agency personnel, ranchers, and home owners - through their work and through their lives, are protecting, maintaining and restoring these magnificent species and their habitats. An uplifting and optimistic approach to a serious environmental crisis, this program tells stories, from Wyoming to California, of the U.S. Forest Service ripping up roads, ranchers using non-lethal methods of predator control, biologists studying urban wildlife, a coalition of diverse individuals and agencies protecting critical wildlife corridors and more. The film deftly illustrates how these beautiful and majestic species, and the places they inhabit, are finding a place in America's landscapes and in the heart and mind of the American public. Other films by John de Graaf are AFFLUENZA, ESCAPE FROM AFFLUENZA, BUYER BE FAIR, SILENT KILLER: The Unfinished Campaign against Hunger, THE MOTHERHOOD MANIFESTO, BEYOND ORGANIC, HOT POTATOES, FOR EARTH'S SAKE: The Life and Times of David Brower, DAVID BROWER: A Conversation with Scott Simon, and WHAT'S THE ECONOMY FOR, ANYWAY?. "With fact, insight, and passion On Nature's Terms shows why we must treasure predators and how we can share our planet with these magnificent creatures." "This video will go far in educating people about large carnivores - their lives, their role in the ecosystem, and why we need to protect them. The video is well-produced, scientifically accurate, engaging and appropriate for a wide audience." "This video effectively portrays the problems faced by large carnivore conservation and the conservation of large wild lands. The two go hand-in-hand. We will not have large carnivores unless we protect large wild lands. This film makes that point!" "[On Nature's Terms] stresses the critical importance of predators in keeping ecosystems healthy, while addressing the concerns of farmers, pet owners, and others who might become the targets of predators. The film is well produced, entertaining without being preachy, and readily accessible to nonscientists."